The following essay was written for our kids’ school’s quarterly magazine. It sort of sums up the experience we had with a dear refugee family from Eritrea that got us started on this journey to begin with. I hope you enjoy it…and picture the strange moments inside of it with a smile! 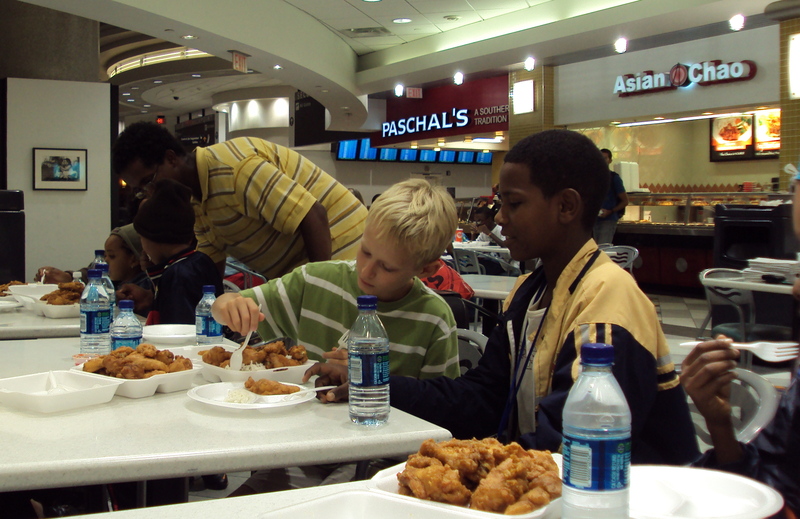 This is our son, Jack, teaching our new friend from Eritrea about airport food and forks on the day the family arrived from Africa. Silly me. Of course. They lived in a cave in the side of a mountain in Africa. Of course there was no stove, no oven, no electricity – only fire. Our family has been in a relationship with this sweet Eritrean family for nearly a year, and I still stumble over my inability to get beyond my American self on the most obvious of points! Oh, well…the value of what we have learned in a year is far more precious than the sum total of the cultural gaffes that we have committed in that time. 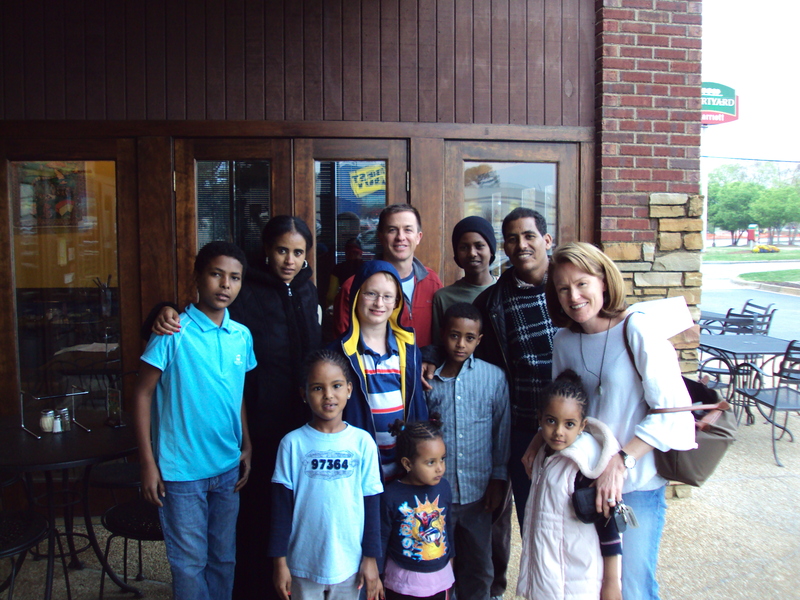 Nearly two years ago, our family first encountered the refugee community in Clarkston, Georgia. Clarkston is only about 20 minutes from Wesleyan – just around I-285, east of Decatur. In the one square mile that makes up the city, nearly 5,000 refugees reside in 20 or so apartment complexes at any given time. The local elementary school boasts of having over 100 dialects spoken within its four walls. According to the United Nations, a refugee is someone who has fled their home country because they faced persecution of some kind – religious, political, etc. There are currently over 15 million refugees living in UN camps in various countries around the globe. Each year, the United States resettles about 80,000 refugees, who have spent an average of 7 years in refugee camps and undergone an extensive application process. Our government offers them three months’ financial assistance when they arrive here, and assigns them a caseworker from a resettlement agency during those first 90 days. After that, they are on their own to navigate a new culture, a new language, and a new way of life. Clarkston has become a center for refugee resettlement. Two years ago, we went with friends from Perimeter Church to lunch in the home of a Bhutanese refugee family. Our three kids were brave about trying the food, and Doug and I were floored by the stories of determination and survival that the refugees shared. These dear people had arrived in the United States with nothing but what they could carry, and they were bravely building a life from the ground up…and doing it with their sense of humor intact. Doug and I spent several months talking and praying about the opportunity to “adopt” a refugee family through World Relief (one of the resettlement agencies.) The commitment was simply to be a friend to the family in an intentional way over a six-month period. However, that commitment felt daunting to me, and I resisted. I felt taxed already by our busy work and school schedule; I was not sure I knew how to handle a foreign friend who might ask things of me that I could not fulfill; and I was concerned that our blended family might just balk at this crazy scheme that threatened to take precious hours from the already reduced time that we are all under one roof. I had a pretty long list of fears about intentionally engaging in a relationship with a needy family during such a busy season of life. At the end of the day, though, God’s direction was clear, and we decided to sign up. I’m so glad that God does not stop working on our hearts after the first…or third…or tenth point of resistance! The family we befriended is a family of nine from Eritrea (a border country with Ethiopia; it sits along the Red Sea). Before coming here, they spent five years at Shimelba, a refugee camp in a barren area of Ethiopia, having fled from political persecution at the hands of a President who was in close alignment with Lybia’s Ghadafi. I was not joking in saying that they had lived in caves dug out of a mountainside…we saw home videos of a wedding with the cave as home base. (I know, go figure – apparently video cameras are ubiquitous!) While watching the video, they joked with us and pointed out the “garage,” which was a cleared out stall where the donkeys stayed, ready to give them transportation when they had someplace to go. The stories are sweet because they are born out of a relationship that is sweet. When we started, we believed that we would be helping a family in need acclimate to life in America. And, yes, we have helped them acclimate. But, really, the joy and the transformation have come in the relationship. In our feeble and often misguided attempts to connect with them (crammed in between cross country meets and flag football games and homework and work obligations), we have been blessed with a new perspective. Doug and I have a new perspective on poverty, on Africa, on our government, on our city, and on the Church. Our kids have a new perspective on friendship, on abundance and lack, on community, on communication, and even on food. God’s call to love the stranger, the widow, and the orphan is central in Scripture. In our suburban world, it can be challenging to build loving relationships with strangers, widows, and orphans. World Relief and Clarkston opened the door for our family to enter into a loving friendship with a family from a country we had never heard of 18 months ago. They are still strangers in the U.S., but they are no longer strangers to us. God has used a service opportunity to humble our hearts toward His deep love for us and toward His deep love for the nations of the world. My students came across your blog the other day as they were doing a research paper on refugees. They found this picture above in google, and all of a sudden recognized one of the boys as one of my students, Yemane. He showed me a more recent picture of himself with your family because I couldn’t believe this was really him in this picture! Anyways, I wanted to reach out in hopes of talking to you about one of my favorite students and his family 🙂 Please e-mail me if you have a few minutes as I would love to talk to you! I look forward to hearing from you. Ashley! I would love to chat directly! I sent you an email, and hopefully you received it. We are huge fans of Yemane and his family. They’re pretty much wonderful!! If you did not get my note, send me an email at kguess@comcast.net. I would love to connect. Have a great weekend!